The story below was shared by the beautiful Marni-Jo Townsley - a woman I met many years ago and am honoured to call a friend. It is about the power of images, the stone stories project, and being brave. I’ve long been an admirer of Julie’s photography. In fact, this is how we met many years ago. Julie had some of her photos in a local gallery. The gallery owner was a mutual friend, and the friendship I had with her allowed me to connect with Julie. Since that initial introduction, I have come to admire and respect Julie as a beautiful, imaginative, compassionate human being. A lover of words and surprises, I think Julie’s stone project is inspired. I appreciate that she photographs the stones in their hidden locations and shares them in this way as well. Not only can the people who stumble upon them benefit from their messages, but those who come across her images can as well. Currently, I am experiencing a challenging period in my life, one in which I feel vulnerable and full of fear. I want to stay safe, but know this is not a path that will lead to growth. I recognize the need to “be brave”, remain in the chaos and vulnerability and see where I’m taken. Julie’s photograph of that small stone with those two small words has been a source of encouragement and empowerment. To me, this is evidence of the power and the far-reaching effect of doing “small things with great love” (Mother Theresa). I had the honour of speaking to a group of high school students about the Stone Stories project through a program called Manitoba A.L.I.V.E. (A Leadership Initiative in Voluntary Efforts). I shared a bit about this project and left them each with a couple stones. One of the counsellors was especially touched by the project. He shared this story with me and said was happy to have it shared here... thank you Carter. Last week on Tuesday my daughter spotted one of your stones placed on a little ledge of a path marker in Assiniboine Forest. Truth be told it was the second stone of yours she found in the last year. Last weeks stone said "be brave", and she immediately ran over to show it to me. She had just begun a series of orthodontic work and I thought, "how fitting"...I found it in the laundry again last night and put it on the coffee maker so I would make a point of joining in the project. I remember feeling remorseful when I didn't join in the first time we found a stone. That one had been placed in a little nook on a yards edge on Wolseley avenue. She found it as we were walking to the park with her brothers and the little girl I care for. I can't remember the exact message but I remember smiling at it. I can't help but wonder if my daughter (age 7) has taught me to pay a little closer attention. Perhaps I am the one who needs to be brave? I suppose we all need to be. Life can be overwhelming, and fear of "feeling" seems to stop me from doing the things I really want to. I've been listening to some thoughts lately on taking action in your own life rather than passively living. I've been "a victim of circumstance" for years. Time to "be brave". Like many people, I struggled a lot in school.. for a number of reasons. Mostly, I just wasn't sure how to fit in. I had a hard life at home, and school wasn't much easier. I had a few good friends, but the truth is that most of the messages I got about myself weren't positive. And so, I didn't think very highly of myself back then. I remember the first person who inspired some new thoughts.. the first time I began to believe in something different. In Grade 10, I had a really amazing french teacher (J.H. Bruns - Madame Pelletier). She saw something in me that nobody else had seen before. She saw my heart and my determination.. and she believed in me. I remember this one particular day, she pulled me aside for a talk. She said: "Do you know that you could be the Prime Minister one day?" I remember laughing.. telling her I don't want to be the Prime Minister. She looked at me, and more seriously said - "yes, but you could be." She told me "I believe in you" and made sure I truly heard her when she said "you can do anything you put your mind to." I have never forgotten those words. Nor the impact of her belief in me... how much one voice can inspire another. How one person reaching out can change the course of someone's life. It's that simple sometimes. Spread love. Life is full of surprises if you're paying attention. The stone stories project is an experiment in serendipity. An experiment to see if the messages on the stone have any resonance to those who find them. 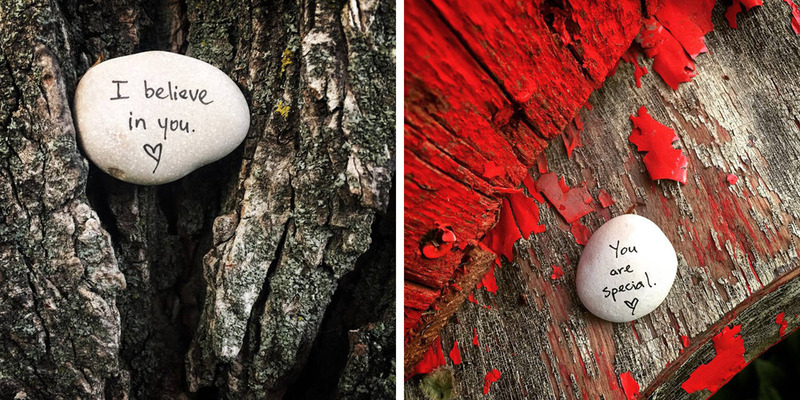 There are many stones hidden in various places in Manitoba, each with a different message. Lots of them have also been photographically documented and will eventually form a series of photo cards and prints. I am curious about the people who find these stones... those who stop and take the time to notice. People like you. Not everyone sees the world in the same way.. many would never find the treasure you have discovered. I would love to hear your story.. a bit about you, your discovery (what the stone said) and if it touched your life. Thank you for contacting me and I hope you will be part of this project! I was walking along Gimli beach in front of the Lakeview hotel with my wife, looking for stones with holes in them. As we were celebrating our 44th wedding anniversary, and this walk on the beach finding these stones is something we have done for as many years. Your stone said LIFE IS FULL OF SURPRISES IF YOUR PAYING ATTENTION. I am an artist in watercolour, stained glass, traditional rug hooking, wood carving etc.. I guess you could say that I am paying attention. I will be going to British Columbia in September and I'll make a copy of your stone to take with me to put on the beach in Steveston BC. I'll use a stone with a hole in it so you can identify it as coming from me. What a beautiful start... a message written on a stone. A moment of connection shared between strangers and a desire to pay forward the love and mystery to someone else. I am a photographer and as of late have been feeling uninspired. I went for a walk in Assiniboine Forest with my dogs and found your stone lodged between 2 branches. It read "It's not what you look at that matters, it's what you see" - Henry David Thoreau. Thank you for inspiring me to pick up my camera again. Priceless! Be brave. Be free. Be true to yourself. Be awesome. My little stone project has been re-inspired lately. I took a trip to the beach to collect stones and since then have been writing notes and placing them out in the world again. For those who don't know.. on one side I write little notes of inspiration or wisdom and on the other side is an email address that people can write to if they find a stone and are compelled to reach out. To date, I have put out hundreds of these stones across Canada. I call the project an experiment in serendipity. I am curious whether the stones have meaning and resonance to those who find them. "I had a feeling as soon as I saw it that it was special., it stood out against the morning grey and looked like it had been placed with care inside a concrete footprint on the dock in Gimli, Manitoba. It reads Be brave. Be free. Be true to yourself. Be awesome." "That's when I saw it, I was instantly drawn to it - also cliche but it felt like it was there for me, it's a very hard feeling to explain. I've had that stone close to me ever since that day and read it everyday to remind myself that even though things are getting harder and life seems dim at some points, that I can still be strong and do and be what and who want all on my own power. I can't thank you enough for putting it there, it's literally a life raft to me." Ah what a beautiful reminder of how easy it is to touch each other with our actions. A total stranger found a life raft in a stone I placed on a pier in Gimli. You just never know what might reach out and touch someone else's life deeply.. all our actions are important.